The initial White Paper was published in 2005 by the American Society of Gastrointestinal Endoscopy/Society of American Gastrointestinal and Endoscopic Surgeons (ASGE/SAGES) Joint Committee serving as a working group to review all issues related to natural orifice transluminal endoscopic surgery (NOTES) . This Committee also created a consortium called NOSCAR (Natural Orifice Surgery Consortium for Assessment and Research), which established guidelines for research related to NOTES, organized meetings, sought funding, and guided other non-US-committees such as the EURO-NOTES. 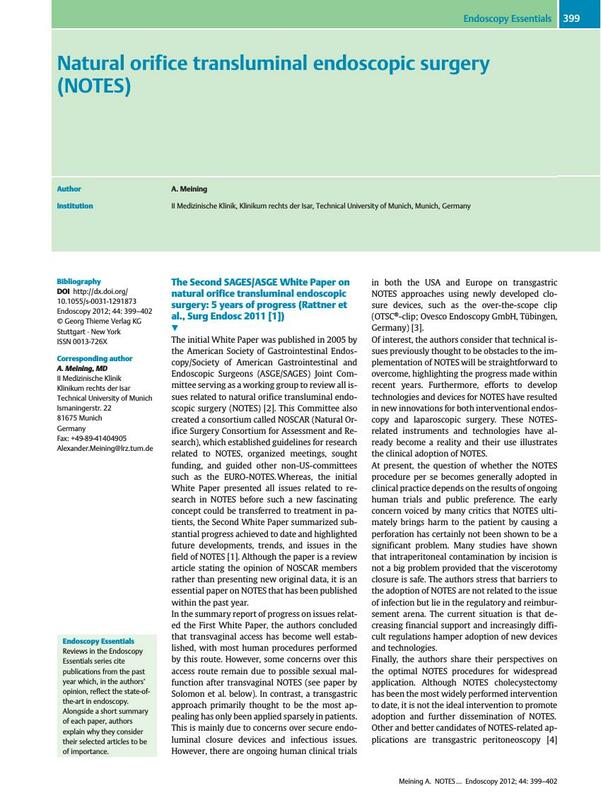 Whereas, the initial White Paper presented all issues related to research in NOTES before such a new fascinating concept could be transferred to treatment in patients, the Second White Paper summarized substantial progress achieved to date and highlighted future developments, trends, and issues in the field of NOTES . Although the paper is a review article stating the opinion of NOSCAR members rather than presenting new original data, it is an essential paper on NOTES that has been published within the past year. In the summary report of progress on issues related the First White Paper, the authors concluded that transvaginal access has become well established, with most human procedures performed by this route. However, some concerns over this access route remain due to possible sexual malfunction after transvaginal NOTES (see paper by Solomon et al. below). In contrast, a transgastric approach primarily thought to be the most appealing has only been applied sparsely in patients. This is mainly due to concerns over secure endoluminal closure devices and infectious issues. However, there are ongoing human clinical trials in both the USA and Europe on transgastric NOTES approaches using newly developed closure devices, such as the over-the-scope clip (OTSC®-clip; Ovesco Endoscopy GmbH, Tübingen, Germany) . Of interest, the authors consider that technical issues previously thought to be obstacles to the implementation of NOTES will be straightforward to overcome, highlighting the progress made within recent years. Furthermore, efforts to develop technologies and devices for NOTES have resulted in new innovations for both interventional endoscopy and laparoscopic surgery. These NOTES-related instruments and technologies have already become a reality and their use illustrates the clinical adoption of NOTES. At present, the question of whether the NOTES procedure per se becomes generally adopted in clinical practice depends on the results of ongoing human trials and public preference. The early concern voiced by many critics that NOTES ultimately brings harm to the patient by causing a perforation has certainly not been shown to be a significant problem. Many studies have shown that intraperitoneal contamination by incision is not a big problem provided that the viscerotomy closure is safe. The authors stress that barriers to the adoption of NOTES are not related to the issue of infection but lie in the regulatory and reimbursement arena. The current situation is that decreasing financial support and increasingly difficult regulations hamper adoption of new devices and technologies. Finally, the authors share their perspectives on the optimal NOTES procedures for widespread application. Although NOTES cholecystectomy has been the most widely performed intervention to date, it is not the ideal intervention to promote adoption and further dissemination of NOTES. Other and better candidates of NOTES-related applications are transgastric peritoneoscopy  and, as discussed below, endoluminal myotomy for achalasia and transanal colorectal surgery. NOTES in a clinical setting has become a reality. Hence, due to the growing data on human NOTES application, only manuscript on NOTES performed in a clinical setting in patients have been selected here as other “NOTES Essentials” published in 2011. 6 von Renteln D, Inoue H, Minami H et al. Peroral endoscopic myotomy for the treatment of achalasia: a prospective single center study. Am J Gastroenterol [In press 2012] DOI: 10.1038/ajg.2011.388. 9 Zorron R, Neubarth Phillips H et al. Perirectal NOTES access: “down-to-up” total mesorectal excision for rectal cancer. Surg Innov [In press 2012.] DOI: 10.1177/1553350611409956.